I spent ten years bouncing between different instruments before I started playing flute. I played violin, piano, drums, and saxophone. I took private lessons, sang in elementary school choir, and played in beginning strings class. After starting saxophone, I joined my small high school’s contemporary music class. With a class size of eight, we didn’t have enough people for a concert band. It was during a break between band rehearsals that I first picked up the flute. I found my director’s old flute from college (a Bundy), and I fell. In. Love. The truth is, I wanted to play flute in fifth grade, but my mom said no. 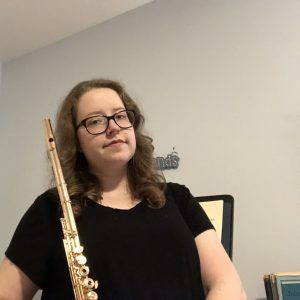 (She claims it’s because I said I wouldn’t practice it…okay Mom) Anyway, those ten years taught me a lot about being a musician, like reading music, and that experience catapulted my flute studies. Since I started so “late,” I had to learn how to practice well so that I could catch up with my peers. I started college at a community college, and I got to school early so that I could snag the best practice room. But I had a part time job, so I couldn’t spend all of my time practicing. I had to work hard AND efficiently if I wanted this dream to become a reality. That hard work paid off when I made co-principal chair after only five years of playing the flute. Seven months after that, I earned my bachelors of music (BM) in flute performance. After a year and a half out of school, I left my job as a bank teller to pursue a masters in flute performance. That year was necessary for me to grow as both a flutist and as a person. I got to do a lot of writing and flute projects including releasing my first original composition online. I have even been published in Huffington Post and The Flute View. Since starting my masters degree, I rediscovered a passion for world music. From a grandmother who loved music to a high school world percussion group, I have always been interested in the music of other cultures. My mission here at Hannah B Flute is to help flutists and music students become musicians. What I mean by this is knowing how to play your instrument but also understanding music theory, music history, and how music plays a role in our lives. There’s a difference between playing music and being a musician. Being a musician involves more than playing your instrument well. You have to contact potential students and clients, schedule lessons and gigs, and work on the business side of being a musician. Even if you’re not a professional, you can’t just play your instrument anymore. So I’m building a library of resources for busy musicians who don’t have much time to practice. I am working on a ton of awesome content. Just. For. You. Some upcoming projects include ebooks, sheet music, flute exercises, and a whole lot more! Looking for help with a music blog? I’m also a freelance music blogger, and I would love to work with you to create the blog of your dreams!